A pint is the only size beer should be served in. These durable Parma 16 oz. mixing glasses are perfect for stacking in bar coolers to keep cold! Stack them with the help of cafeteria trays to limit sticking, and serve ice cold beer in ice cold glasses! 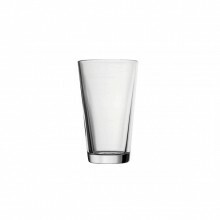 These glasses are perfect for bars, restaurants, and caterers, as they remain durable and chip-free through each use. Ensure that your glassware is always shiny and clean, by using the proper commercial dishwasher for your establishment!